There is something addicting about jumping (jump drives and jump bridges) in Eve. I didn't know until I possessed the ability to do it. Once I could do it the taste of it slowly sank into me. "I could just jump my carrier..." became a theme that trickled into my mind when dealing with situations and logistics. I have not succumbed to its sweet, siren song but I feel my defenses weakening. I purchased a Loki to do black ops drops with when Retribution 1.1.1 was released and black operations were tweaked. The funny part was the only reason I could fly a Loki that qualified is due to my having purchased one to work on my security status in null sec. I have used that Loki exactly once. I have used this Loki for black operations twice now. I suspect it will gain more use then my ratting Loki. However, one day I really might work on the security status thing. Maybe. Eve is full of abbreviations They are a mixture of technical language and in game language. Some things are just a way of saying a long name quickly. NaPoc - commonly called a Navy Apoc but in reality it is: Apocalypse Navy Issue. SFI - Stabber Fleet Issue (this can also be Scythe Fleet Issue because Eve is not confusing). Sometimes words are just fun. Blops or BlOps stands for Black Operations. It is fun to say. These are stealthy fighting ships that recently received a buff that has made them quite the popular new toy. Black Ops have not been something I've thought much about. When I think of them I think of the black ops battleships. 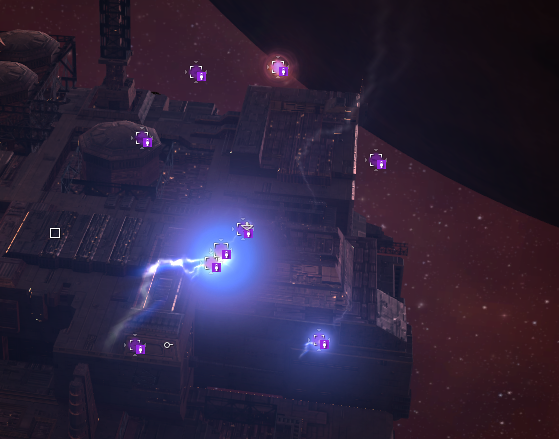 Ships that can open a jump portal for covert operation ships to jump through. I've done this once, after a POS bash when I was hauling the loot with my Viator. It was super fun. The jump bridge is black and streaked with white and blue electricity. Jumping is, in and upon itself, a very fun concept. You have to manage fuel for it, it is skill intensive to train into, and well its teleportation. Teleportation is fun. It has an amazing graphic. On the forums you can often hear people ask "what was that sparkling effect?" as ships jump off the undock of trade hubs. Interestingly enough, jumping opened up at once for me in multiple ways across different accounts. Chella gained the ability to fly and jump her carrier at the same time my industrial account gained the ability to fly and jump a jump freighter at the same time that Sugar trained into a Loki and gained access to dark bridges with black ops ships. Unplanned. Unimportant. Still, interesting to me how it all came together. It's interesting you bring up jumping this weekend, because it's a topic I wrote about, myself yesterday. I thought of the idea of introducing a rig that would allow any ship to gain the ability to jump (with fuel consumption of course). It's probably a horrible idea, but it's interesting to think about how it would completely change the nature of the game.